Nobody ever wants a loved one to experience a medical emergency. This is true whether they are our friends, our family members or our pets. But, when our pets are exposed to dangerous situations and need urgent help, we often are more confused on how to help them than we are with fellow humans. If you are prepared and act quickly though, you can ensure your animal companions live to see another day. Just like in humans, dogs and cats can experience heart and breathing emergencies, like choking, heart attack and stroke. Rescue breaths can be administered if the animal has stopped breathing and chest compressions if the heart is not beating. Breaths go in the nose as you hold the mouth shut, which is different than how they are performed on people. The heart is also located in different places for different species, so you may want to research how chest compressions are done for your pet. When an animal overheats, they need to be placed in the shade or a cool place immediately before heat stroke sets in. Water can help carry away heat from their bodies, so using a wet rag, pouring cool water on the belly or even using a hose gently on them can help regulate their temperature. Alcohol can be applied to their paws to help cool the body temperature as well. Bone breaks and muscle tears are very painful for animals. Whether from a fall, being struck by a car or anything else, the affected area should be immobilized with a splint and possibly even a stretcher. Muzzling a dog may be necessary because they will become more defensive when injured. A pet who encounters an allergen may need a dose of Benadryl for a normal reaction or even an epi-pen if they are going into anaphylaxis. During a severe allergic reaction a pet owner may have to act quickly and should call an emergency veterinarian. With any open wound, it is advisable to put pressure on the opening to slow bleeding. Cleaning the wound with an antiseptic solution and clean bandages may be the next step. 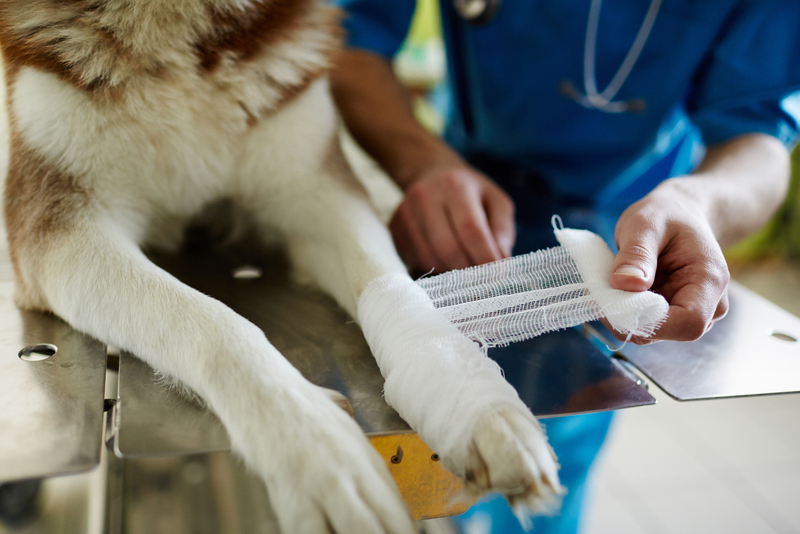 You may want to review the American Veterinary Medical Foundation’s more detailed advice on many of these situations if you have concerns. Also, the Red Cross offers animal first aid and courses online that can provide information that will be very useful in an emergency. But most importantly, make sure to have the number and location of a good, nearby veterinarian. They will give you specific instructions for your pet’s situation. In Chapel Hill and the surrounding areas, Dogwood Veterinary Hospital & Pet Resort is prepared to assist during a pet emergency. Keep the number (919) 942-6330 at hand in case of your pet is in need of urgent help and we can give instructions over the phone on what to do next. Our mission is to offer each pet the best care possible while providing superior client service.